The time may come when an elderly person needs to move into a care home. For many, however, the fear of being separated from their cherished pet may cause many folk to avoid the subject altogether until they have no alternative. And some actually refuse to go at all. If you are a relative who has the task of finding a home for your loved one, consider their overall needs, but don’t under-estimate the bond between an elderly person and their pet. 2. 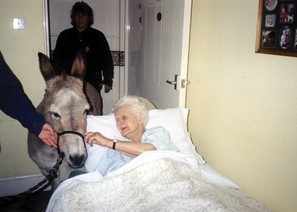 Don’t assume that a care home won’t take pets. Much is dependent on the person in charge. If they are animal lovers, they are better placed to understand the bond between pet and owner and are more likely to say “yes”. So just ask if your pet can come with you. Older people need to choose pets carefully as they advance in years. A small mature dog is more likely to appeal to a care home than an excitable puppy or a large dog. Most homes will want to talk to a would-be resident (and meet their pet) before agreeing to Fido or Tiddles coming too. Pets must be clean, healthy and up to date with vaccinations, flea treatments, worming etc and well behaved. Photo copyright of the Donkey Sanctuary. The Cinnamon Trust has been enabling elderly people and their pets to stay together for 25 years. Its Pet Friendly Care Homes Star Rated Guide lists homes taking pets in the UK. The Cinnamon Trust will also send you a printed list of homes taking pets in the area you want. They have a network of volunteers who help the elderly with pet care, either in private or care homes. There’s many a home manager who has sent a member of staff having a stressful day to have a quiet few moments and a cuddle with a resident pet. Pets give everyone a safe topic of conversation. They provide moments of merriment and laughter, and act as social catalysts. Pets offer a talking point when grandchildren come to visit. They can also lessen the amount of attention residents want from staff. And the right sort of pet excels at lowering blood pressure and stress levels. And of course, pets help elderly people to feel needed and wanted, and to avoid the three plagues of care homes, identified by the Eden Alternativeas boredom, loneliness and helplessness. Were reluctant to confide in staff, in case the real reason for their unhappiness would be trivialised. The researchers from Warwick University concluded that having visiting animals did not alleviate such personal distress. It’s easy to assume that an elderly person and their pet will need to part, when the time comes for the former to move into a home, and that both “will soon get over it”. It doesn’t need to happen. Many homes put themselves out to be pet friendly, as staff understand and appreciate the therapeutic benefits of the animal-human bond and the relationship between elderly person and their pet. There will lots of information to gather when finding a care home for an elderly relative and it's not an easy ride for many of us. But do your research, and an elderly person and pet could have a good many happy years together, while giving others many magical moments too - and it could mean a relative settles far more quickly and happier if their loving, loyal friend is by their side. The Society for Companion Animal Studies have a list of questions to ask a care home if you're looking for a pet friendly care home, plus useful information on finding a pet friendly care home, preparing a case for support, questions to ask a housing manager, issue a housing manager might raise. The Cinnamon Trust has volunteers around the UK who can help with pet care for the elderly and terminally ill in the UK in both care homes & private homes. It also has a list of homes around the UK which take pets in with their owners. Pets for Life - a campaign to highlight the widespread lack of a coherent policy on pet ownership in residential care homes and the sheltered accommodation throughout the UK. This campaign is endorsed by the Dogs Trust, Anchor Housing & Hanover Housing.